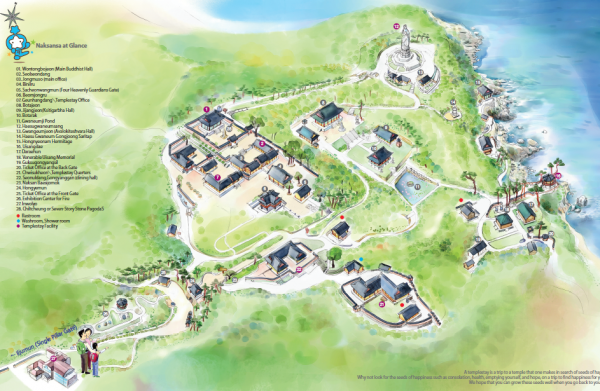 The sacred Gwaneum land of Naksansa was founded by Grand Master Uisang when he came to pay homage to Gwaneumbosal about 1,340 years ago. It marks the beginning of the Gwaneum belief system in Korea, and offers the same comfort to you as if you were being held in a mother’s embrace. 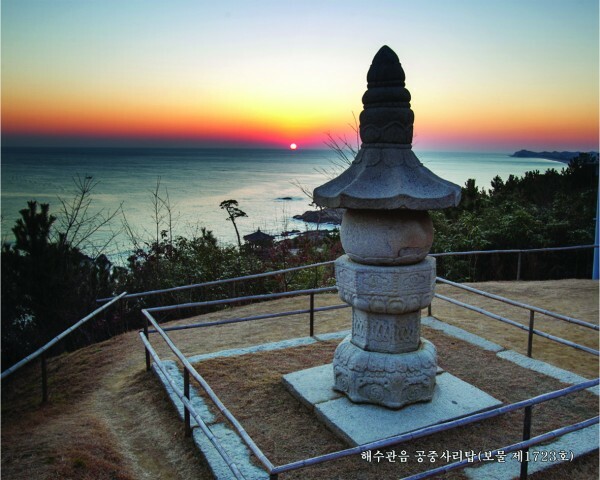 The land also offers a great view of the East Sea, with its breathtaking scenery, as well as Haesu gwaneum Sang Statue and Haesugwaneum Gongjoong Sarira(Treasure No. 1723) Stupa etc. commemorating Jinsinsari. The power of the Gwansaeeumbosal vow is believed to work in a mysterious way, connecting people together. She uses her mighty power to help sentient beings. Therefore, an endless stream of visitors continues to come to this place and invoke her name even today. Put your weary life behind, and meet the new confident you by discovering your dream and declaring your firm commitment. We will be with you as you walk along the path toward realizing your dream. As the Main Bodhisattva's Hall of the temple, Wontongbojeon is a structure symbolic as the sacred home to Gwaneum belief. This hall is also called Wontongjeon, or Gwaneumjeon. Its main purpose is to enshrine Gwansaeeumbosal, or Avalokiteshvara Bodhisattva. This is one of the eight most famous spots in Eastern Korea. When Venerable Uisang returned from China, he came over to survey the area before constructing the temple. Afterwards, he spent some time meditating here. In the midst of the pine trees near the East Sea, you can find a gazebo along side the rock walls. 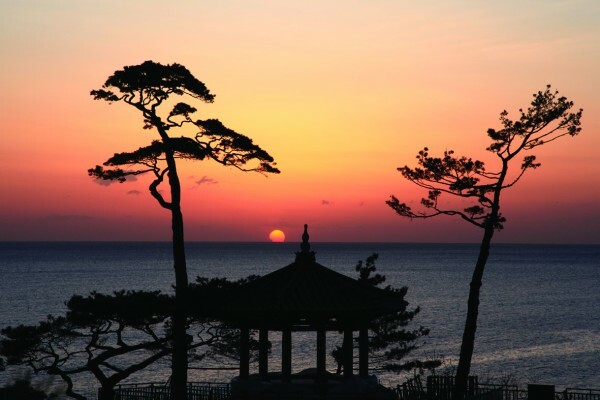 As you sit in the gazebo of Uisangdae and look out over the landscape, the sunset is simply the best. 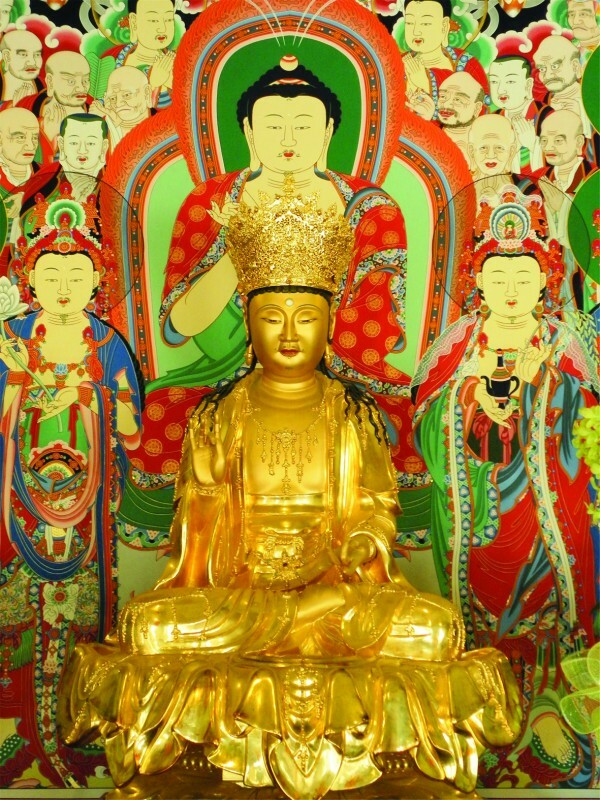 The main Bodhisattva Avalokitesvara (the Goddess of Mercy) enshrined in the hall was designated as Treasure No. 1362 in 2003. This statue shows a rare glimpse of the type of Bodhisattva Avalokitesvara statue traditionally seen during the late Goryeo Dynasty, clothed with linen in lacquer coating. Simple serenity fills you as you just sit there in its presence. 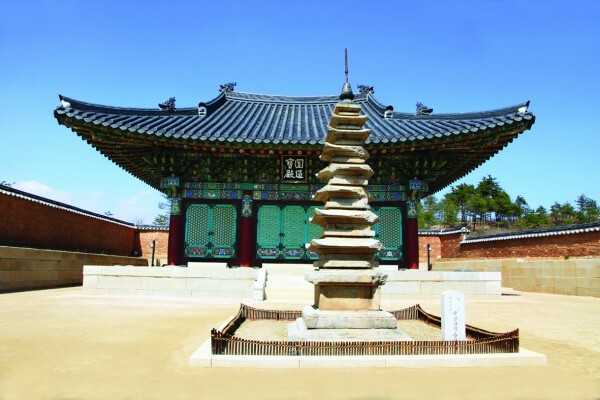 This stupa was built by Bhikku Seokgyeom, in hopes that his greatest wish would be granted. According to the epitaph there, a coat of gold was added to the statue in 1683 for Hongnyeonam Hermitage. It is said that a Jinsinsari, or holy sarira of the Buddha, fell from the sky, so they were enshrined together. 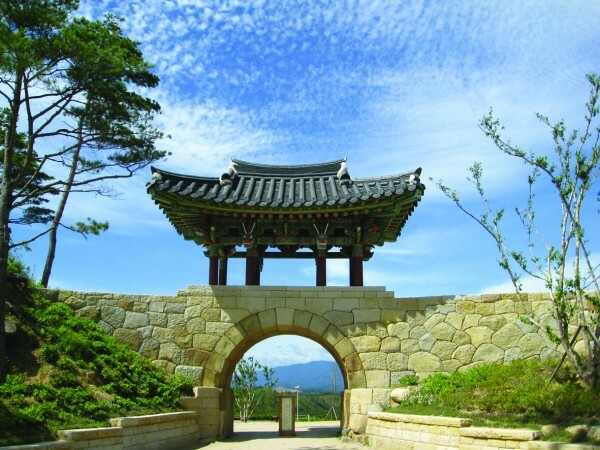 The twin rainbow-shaped stone gate at the temple entrance was created to commemorate the visit of King Sejo, the 7th King of the Joseon Dynasty in 1467. At the time, there were 26 counties in Gangwondo, so 26 stones were collected, one from each county, to construct this structure.